I recommend your two nights stay at Yuge-shima island rather than one night. Because it has a good port, the beautiful nature, friendly and kindly people in the historic ambience. People’s favorable attitude toward sailing boats makes an inexpensive fee pontoon with water and power services. The mooring fee is less than JPY 500 ! Same with the last year. There are free but not frequent bus services to go to the hot spring. The village’s JPY100 bus services also take you there. You can get the time table, when you check in the pontoon. Utilize those services to save time. There is a coin laundry at the hot spring. You may bring detergent by yourself or buy it there. between Inno-shima island and Yuge-shima island. you will have a wide-angle inside view of Yuge-shima port. You can find pontoons at the left of the town hall’s white big building. There are three pontoons. The first shore side one is not available. The both sides of two sea side pontoons are available for your mooring. Check in at the town hall. Fuel is in front of the pontoon. Water and Power at the pontoonA 24 hour toilet is at the front side of the town hall. You may also use a toilet inside from 8 am. Less than 10 minutes walk away, there are two big clean super markets with lots of items. One is A-COOP. 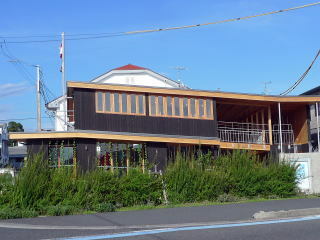 Another is located next to the ferry port. You may climb up a hill for 20 minutes to a hotel which has a great hot spring, or Onsen in Japanese. 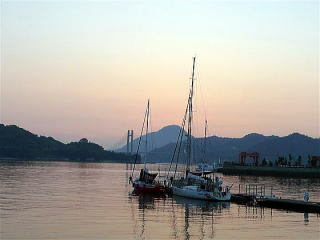 You can enjoy various types of Onsen seeing the splendid view of Setouchi sea and islands. The fee is just JPY 600 ! The hotel also has a coin laundry. 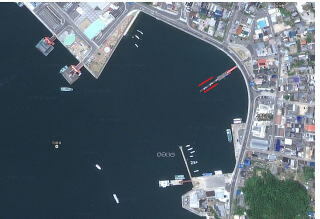 The pontoon is owned by the town of Kamijima which includes Yuge-shima island.